Radhika came to my clinic for the complaints of excessive sweating of palms and soles. She almost used to have cold clammy palms throughout the day, more pronounced while she studied for her exams. She had stopped using an ink-pen since the sweating used to bloat the writing. She had hyperhydrosis. It is a condition that leads to excessive sweating - either on the entire body or on specific parts. It was very embarrassing for her to shake hands with anybody since the immediate reaction from the opposite person used to be removing the hand as early as possible and wiping it. She had marked chilly response to the environment, fanning and would need more woolen garments than her friends. She was prescribed Silica in infrequent doses [weekly one dose]. Within two months, her perspiration reduced significantly and she could perform her daily chores without any discomfort. Homeopathy has always proved itself as the best therapy for hyperhydrosis. Modern medicine does not have anything to offer to these patients. Homeopathy treats this complaint as a dispositional derangement. Thus assessing the emotional - intellectual - physical composition of the individual to select a suitable constitutional remedy is the key to success. The patient of calcarea carb constitution sweats profusely while sleeping - almost wetting the pillow, like the patients of silica or sanicula. There is also perspiration on the back of the head, neck and chest. Mostly sweats in the upper part of the body. The sweat has a sour smell and the sweating is more during sleep. Conium also sweats more during sleep; almost as soon as one sleeps or even when closes eyes to sleep. Exactly opposite is seen in Sambucus - where there is a profuse sweat over the entire body during waking hours, while on going to sleep, the dry heat returns. If calcarea sweat smells sour, the sweating of Bovista smells like an onion. Offensive sweating is a characteristic of many remedies including Alumina, Graphites, Psorinum, Phosporus, Sanicula, Thuja and their leader Silica. Among these, phosphorus sweat has the odor of sulphur fumes, while thuja smells like honey. Most of these also show a tendency to sweat more on palms and soles. If we are discussing the smell of the perspiration, the taste should not be left un-noted. The remedy Caladium has a unique quality - the sweating of this remedy is sweet in taste, so much that it can even attract flies. It has got yet another characteristic - the patient of caladium sweats profusely after any acute diseases, so distinctly that we can even say that the profuse sweat relieves all sufferings in caladium [also in Natrum mur]. Thuja shows sweating only on uncovered parts, or all over except the head. These patients also sweat a lot of sour smelling or fetid sweat during sleep. The prominent remedy for cholera, Veratrum album has cold perspiration on the forehead with nearly all complaints. Tabacum has it all over the body. Isn't it interesting to know the various characteristic features that a remedy can throw just in the pattern of sweating? Knowing all this will not only improve our remedy selection but also our case-taking. We would only ask those questions, whose probable answers we expect already. 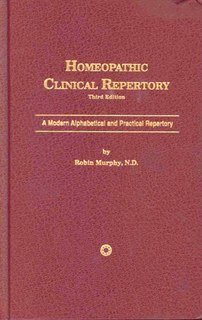 The Homeopathic Clinical Repertory has already overtaken the other big repertories in the USA. It has the advantage of a simple alphabetic structure that makes it easy to use, so that even beginners can quickly find what they are looking for. Many homeopaths have confirmed that it is handy and practical – they say it is now the only work they use. It is just as comprehensive as the other big repertories (over 2.300 remedies). It also contains new clinical rubrics such as Ebola, ADHD, chronic fatigue und multiple sclerosis. - Time including seasons, periodicity, hours, times of day. 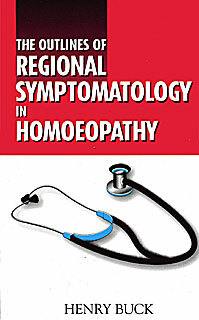 The publisher: This book, The Outlines of Regional Symptomatology in Homoeopathy, is divided in different Regions, for example, Abdomen, Throat & Pharynx, Respiration & Chest, Neck & Back, etc. Under each region the remedies are given with their symptomatology. The book is very handy when the physician is searching for remedies region. Amit - Excellent article. Sweating can be a keynote and prominent rubric to help narrow down the appropriate remedy. I like the way you presented the differentiation. Thanks so much.